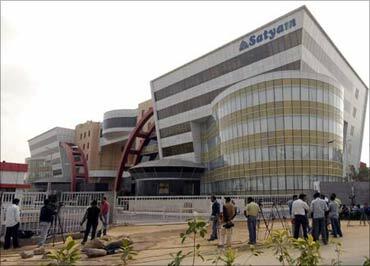 Employees of Mahindra Satyam, the erstwhile Satyam Computer Services, say they are not worried about the financials of the company. Last week, Mahindra Satyam reported an aggregate loss of Rs 8,300 crore (Rs 83 billion) for 2008-09 and 2009-10. "The results were a very honest statement that the company has given. And keeping in view the liabilities they had, I feel it was a very good exercise that they had done, considering the complexities involved. It was a fruitful projection of the status of the company," said Varun Kumar (name changed), an employee for over 10 years. Two days after Mahindra Satyam announced its restated financial accounts, most employees Business Standard had a chance to meet at the company's Madhapur campus, Satyam Infocity, were brimming with confidence. A few who had gone through the turbulent times after Ramalinga Raju, the founder and chairman of Satyam Computer Services, confessed to fudging the books, say they feel confident and stable in the hands of the new management. "The financial disclosures have eased the concerns among clients. And in fact, we have started to enjoy respect in the market after the results' announcement and now we are feeling more safe in the hands of the Mahindra & Mahindra group," Kumar said. For Hardesh, a B1 band (leadership position) associate (the satyam term of a staffer), it's work as usual. A large US-based customer that his 500-odd technology team has been working with is more confident now about delivery. 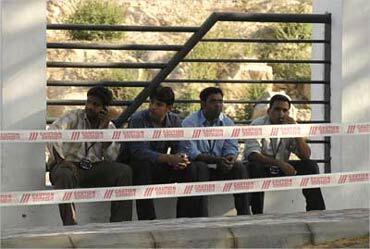 Hardesh feels the employees had not expected the results to be 'jazzy' and that the company management is in the process of reinforcing the 'bench', which was cut to half as part of a rightsizing exercise undertaken a year ago. "The current facility (Satyam Infocity, which also houses the company's headquarters) is full to its 5,000 capacity and the company is coming up with a new 3,000-seater building within the same campus. Besides, with enquiries from new clients from various geographies and extended contracts from existing customers, the company is enhancing its bench to a sizable strength," Hardesh said. On the service delivery front, some clients are not satisfied, feels Satyen Gupta, an associate from the delivery practice. "From day one, customers left. It's not because the delivery was bad. Earlier, it used to be appreciation. Today, it is for granted. Because during any change, there is always a challenge. There is some kind of stabilisation that still needs to happen. However, the M&M leadership are putting all these things together," he said. Sowmya Rao, an associate, feels though the Mahindra management had not disturbed the overall fabric of human relations, fear in terms of job cut still persist among some Satyamites, as the employees are called at the information technology (IT) outsourcing company, after the proposed reverse merger happens. This is likely after the announcement of the Q1 and Q2 results of 2010-11 on November 15. "In the event of merger, my gut feeling is that there will be some job cuts, as there will be some multiple elements clashing in terms of expertise. Like, we are strong on the engineering side, while Tech Mahindra is strong at telecom. Job cuts are bound to happen. but largely in the senior level. 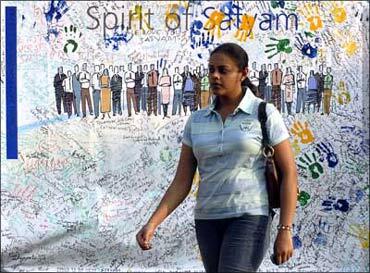 Uncertainty on job losses among the entry and mid-level employees will gradually wafer out after the merger," she said. After the restatement of accounts, Mahindra Satyam employs about 27,000 associates, including its BPO arm. The Mahindra Satyam management had made it clear that the merger would happen after November 15. Employees, however, feel the merged entity would certainly be in a better position to go out in the market and compete with other top Indian IT services firms and global companies.